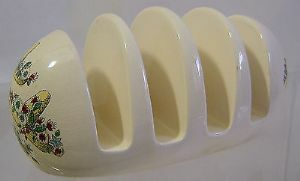 This is a delightful 4-Slice Toastrack in the 'Mexican Madness' Pattern from Beswick. This range of tableware of which we have a declining number of different items (currently), is now very collectable. Produced in the 1950s, the series has images of Mexican-style somberos with multicoloured garlands of flowers adorning, set on a cream ground. This Toastrack measures 6 inches (15 cms) in length. The condition is excellent with the slight trace of crazing evident. It is backstamped appropriately under the base.. I'm happy to provide further photos.